Read any contract you’re asked to sign, and make sure you understand any terms or conditions. After declining dramatically a few years ago, auto sales are up, leasing offers are back, and incentives and deals abound. So if you’re in the market for a new vehicle, should you buy it or lease it? To decide, you’ll need to consider how each option fits into your lifestyle and your budget. The chart below shows some points to compare. When the vehicle is paid for, it’s yours. You can keep it as long as you want, and any retained value (equity) is yours to keep. You don’t own the car–the leasing company does. You must return the vehicle at the end of the lease or choose to buy it at a predetermined residual value; you have no equity. When you sell your vehicle, condition matters, so you may receive less if it hasn’t been well maintained. As your vehicle ages, repair bills may be greater, something you generally won’t encounter if you lease. You generally have to service the vehicle according to the manufacturer’s recommendations. You’ll also need to return your vehicle with normal wear and tear (according to the leasing company’s definition), so you may be charged for dents and scratches that seem insignificant. These may include the total negotiated cost of the vehicle (or a down payment on that cost), taxes, title, and insurance. Inception fees may include an acquisition fee, a capitalized cost reduction amount (down payment), security deposit, first month’s payment, taxes, and title fees. You’ll need to consider resale value. All vehicles depreciate, but some depreciate faster than others. If you decide to trade in or sell the vehicle, any value left will be money in your pocket, so it may pay off to choose a vehicle that holds its value. A vehicle that holds its value is generally less expensive to lease because your payment is based on the predicted depreciation. And because you’re returning it at the end of the lease, you don’t need to worry about owning a depreciating asset. If your vehicle is financed, the lien holder may require you to carry a certain amount of insurance; otherwise, the amount of insurance you’ll need will depend on personal factors and state insurance requirements. You’ll be required to carry a certain amount of insurance, sometimes more than if you bought the vehicle. Many leases require GAP insurance that covers the difference between an insurance payout and the vehicle’s value if your vehicle is stolen or totaled. GAP insurance may be included in the lease. You may want to sell or trade in the vehicle, but the timing is up to you. If you want, you can keep the vehicle for many years, or sell it whenever you need the cash. At the end of the lease, you must return the vehicle or opt to buy it according to the lease terms. Returning the vehicle early may be an option, but it’s likely you’ll pay a hefty fee to do so. If you still need a vehicle, you’ll need to start the leasing (or buying) process all over. The IRS has not yet released guidance concerning Section 179 and Bonus Depreciation as it relates to vehicles for the year 2013. The guidance will be published in the Internal Revenue Bulletin sometime after April 15th, 2013. So be patient, and check back here often for the release date. Please note that there are a number of qualifications for vehicles, all with varying tax treatment. is limited to $11,060 for cars and $11,160 for trucks and vans. §Qualified non-personal use vehicles specifically modified for business (i.e. van without seating behind driver, permanent shelving installed, and exterior painted with company’s name). January 10 Employees – who work for tips. If you received $20 or more in tips during December, report them to your employer. You can use Form 4070, Employee’s Report of Tips to Employer. January 15 Employers – Social Security, Medicare, and withheld income tax. If the monthly deposit rule applies, deposit the tax for payments in December 2012. Individuals – Make a payment of your estimated tax for 2012 if you did not pay your income tax for the year through withholding (or did not pay in enough tax that way). Use Form 1040-ES. This is the final installment date for 2012 estimated tax. However, you do not have to make this payment if you file your 2012 return (Form 1040) and pay any tax due by January 31, 2013. Employers – Nonpayroll Withholding. If the monthly deposit rule applies, deposit the tax for payments in December 2012. Farmers and Fishermen – Pay your estimated tax for 2012 using Form 1040-ES. You have until April 15 to file your 2012 income tax return (Form 1040). If you do not pay your estimated tax by January 15, you must file your 2012 return and pay any tax due by March 1, 2013, to avoid an estimated tax penalty. January 31 Employers – Give your employees their copies of Form W-2 for 2012 by January 31, 2013. If an employee agreed to receive Form W-2 electronically, post it on a website accessible to the employee and notify the employee of the posting by January 31. Businesses – Give annual information statements to recipients of 1099 payments made during 2012. Employers – Federal unemployment tax. File Form 940 for 2012. If your undeposited tax is $500 or less, you can either pay it with your return or deposit it. If it is more than $500, you must deposit it. However, if you already deposited the tax for the year in full and on time, you have until February 11 to file the return. Employers – Social Security, Medicare, and withheld income tax. File Form 941 for the fourth quarter of 2012. Deposit any undeposited tax. (If your tax liability is less than $2,500, you can pay it in full with a timely filed return.) If you deposited the tax for the quarter in full and on time, you have until February 11 to file the return. Employers – Nonpayroll taxes. File Form 945 to report income tax withheld for 2012 on all nonpayroll items, including backup withholding and withholding on pensions, annuities, IRAs, gambling winnings, and payments of Indian gaming profits to tribal members. Deposit any undeposited tax. (If your tax liability is less than $2,500, you can pay it in full with a timely filed return.) If you deposited the tax for the year in full and on time, you have until February 11 to file the return. Individuals – who must make estimated tax payments. If you did not pay your last installment of estimated tax by January 15, you may choose (but are not required) to file your income tax return (Form 1040) for 2012. Filing your return and paying any tax due by January 31 prevents any penalty for late payment of last installment. Payers of Gambling Winnings – If you either paid reportable gambling winnings or withheld income tax from gambling winnings, give the winners their copies of Form W-2G. Certain Small Employers – File Form 944 to report Social Security and Medicare taxes and withheld income tax for 2012. Deposit or pay any undeposited tax under the accuracy of deposit rules. If your tax liability is $2,500 or more from 2012 but less than $2,500 for the fourth quarter, deposit any undeposited tax or pay it in full with a timely filed return. Alternative Minimum Tax (AMT) Exemption amounts for the AMT are now permanent and indexed for inflation and allow the use of nonrefundable personal credits against the AMT. Retroactive to January 1, 2012, exemption amounts are $50,600 (individuals) and $78,750 (married filing jointly). These amounts are indexed for inflation in 2013. “Kiddie Tax” For taxable years beginning in 2013, the amount that can be used to reduce the net unearned income reported on the child’s return that is subject to the “kiddie tax,” is $1,000 (up from $950 in 2012). The same $1,000 amount is used to determine whether a parent may elect to include a child’s gross income in the parent’s gross income and to calculate the “kiddie tax”. For example, one of the requirements for the parental election is that a child’s gross income for 2013 must be more than $1,000 but less than $10,000. Health Savings Accounts (HSAs) Contributions to a Health Savings Account (HSA) are used to pay current or future medical expenses of the account owner, his or her spouse, and any qualified dependent. Medical expenses must not be reimbursable by insurance or other sources and do not qualify for the medical expense deduction on a federal income tax return. Medical Savings Accounts (MSAs) There are two types of Medical Savings Accounts (MSAs): the Archer MSA created to help self-employed individuals and employees of certain small employers, and the Medicare Advantage MSA, which is also an Archer MSA, and is designated by Medicare to be used solely to pay the qualified medical expenses of the account holder. To be eligible for a Medicare Advantage MSA, you must be enrolled in Medicare. Both MSAs require that you are enrolled in a high deductible health plan (HDHP). Self-only coverage.For taxable years beginning in 2013, the term “high deductible health plan” means, for self-only coverage, a health plan that has an annual deductible that is not less than $2,150 (up $50 from 2012) and not more than $3,200 (up $50 from 2012), and under which the annual out-of-pocket expenses required to be paid (other than for premiums) for covered benefits do not exceed $4,300 (up $100 from 2012). Family coverage. For taxable years beginning in 2013, the term “high deductible health plan” means, for family coverage, a health plan that has an annual deductible that is not less than $4,300 (up $100 from 2012) and not more than $6,450 (up $150 from 2012), and under which the annual out-of-pocket expenses required to be paid (other than for premiums) for covered benefits do not exceed $7,850 (up $200 from 2012). Increased AGI Limit for Deductible Medical Expenses In 2013, the amount individuals can deduct for medical expenses increases to 10 percent of AGI. The 7.5 percent threshold continues through 2016 for taxpayers aged 65 and older, including those turning 65 by December 31, 2016. Eligible Long-Term Care Premiums Premiums for long-term care are treated the same as health care premiums and are deductible on your taxes subject to certain limitations. For individuals age 40 or less at the end of 2013, the limitation is $360. Persons over 40 but less than 50 can deduct $680. Those over age 50 but not more than 60 can deduct $1,360, while individuals over age 60 but younger than 70 can deduct $3,640. The maximum deduction $4,550 and applies to anyone over the age of 70. Medicare Taxes Starting in 2013, there will be an additional 0.9 percent Medicare tax on wages above $200,000 for individuals ($250,000 married filing jointly). Also starting in 2013, there is a new Medicare tax of 3.8 percent on investment (unearned) income for single taxpayers with modified adjusted gross income (MAGI) over $200,000 ($250,00 joint filers). Investment income includes dividends, interest, rents, royalties, gains from the disposition of property, and certain passive activity income. Estates, trusts and self-employed individuals are all liable for the new tax. Foreign Earned Income Exclusion For taxable years beginning in 2012, the foreign earned income exclusion amount is $97,600, up from $95,100 in 2012. Long-Term Capital Gains and Dividends In 2013 tax rates on capital gains and dividends for taxpayers whose income is at or below $400,000 ($450,000 married filing jointly) remain the same as 2012 rates. As such, for taxpayers in the lower tax brackets (10% and 15%), the rate remains 0%. For taxpayers in the middle tax brackets, the rate is 15%. An individual taxpayer whose income is at or above $400,000 ($450,000 married filing jointly), the rate for both capital gains and dividends is capped at 20% (up from 15% in 2012). Estate and Gift Taxes For an estate of any decedent during calendar year 2013, the basic exclusion amount is $5,120,000 (indexed for inflation–same as 2012). The maximum tax rate rises to 40% (up from 35% in 2012). The annual exclusion for gifts increases to $14,000 (up from $13,000 in 2012). Adoption Credit In 2013, a non-refundable (only those individuals with tax liability will benefit) credit of up to $10,000 is available for qualified adoption expenses for each eligible child. Earned Income Tax Credit For tax year 2013, the maximum earned income tax credit (EITC) for low and moderate income workers and working families rises to $5,981, up from $5,891 in 2012. The credit varies by family size, filing status and other factors, with the maximum credit going to joint filers with three or more qualifying children. Child Tax Credit For tax year 2013, the child tax credit is $1,000 per child. Child and Dependent Care Credit The child and dependent care tax credit was permanently extended for taxable years beginning in 2013. If you pay someone to take care of your dependent (defined as being under the age of 13 at the end of the tax year or incapable of self-care) in order to work or look for work, you may qualify for a credit of up to $1,050 or 35 percent of $3,000 of eligible expenses. For two or more qualifying dependents, you can claim up to 35 percent of $6,000 (or $2,100) of eligible expenses. For higher income earners the credit percentage is reduced, but not below 20 percent, regardless of the amount of adjusted gross income. American Opportunity Tax Credit and Lifetime Learning Credits The American Opportunity Tax Credit (formerly Hope Scholarship Credit) is extended to the end of 2017. The maximum credit is $2,500 per student. The Lifetime Learning Credit remains at $2,000. Interest on Educational Loans Starting in 2013, the $2,500 maximum deduction for interest paid on student loans is repealed and no longer limited to interest paid during the first 60 months of repayment. The deduction is phased out for higher-income taxpayers. Tuition and Related Expenses Deduction In 2013, there is once again an above-the-line deduction of up to $4,000 for qualified tuition expenses. This means that qualified tuition payments can directly reduce the amount of taxable income, and you don’t have to itemize to claim this deduction. However, this option can’t be used with other education tax breaks, such as the American Opportunity Tax Credit, and the amount available is phased out for higher-income taxpayers. Contribution Limits The elective deferral (contribution) limit for employees who participate in 401(k), 403(b), most 457 plans, and the federal government’s Thrift Savings Plan is increased from $17,000 to $17,500. Contribution limits for SIMPLE plans increase from $11,500 to $12,000. The maximum compensation used to determine contributions increases to $255,000 (up $5,000 from 2012 levels). Income Phase-out Ranges The deduction for taxpayers making contributions to a traditional IRA is phased out for singles and heads of household who are covered by an employer-sponsored retirement plan and have modified adjusted gross income (AGI) between $59,000 and $69,000, up from $58,000 and $68,000 in 2012. Saver’s Credit The AGI limit for the saver’s credit (also known as the retirement savings contribution credit) for low and moderate income workers is $59,000 for married couples filing jointly, up from $57,500 in 2012; $44,250 for heads of household, up from $43,125; and $29,500 for married individuals filing separately and for singles, up from $28,750. Standard Mileage Rates The rate for business miles driven is 56.5 cents per mile for 2013, up from 55.5 cents per mile in 2012. Section 179 Expensing For 2013 the maximum Section 179 expense deduction for equipment purchases increases to $500,000 of the first $2,000,000 of business property placed in service during 2013. The bonus depreciation of 50% is also extended through 2013. Transportation Fringe Benefits If you provide transportation fringe benefits to your employees, for tax years beginning in 2013 (through 2017) the maximum monthly limitation for transportation in a commuter highway vehicle as well as any transit pass is $240. The monthly limitation for qualified parking is also $240. Don’t hesitate to call us if you want to get an early start on tax planning for 2013. We’re here to help! * The Temporary Payroll Tax Cut Continuation Act of 2011 reduced the Social Security payroll tax rate by 2% on the portion of the tax paid by the worker through the end of February 2012. The Middle Class Tax Relief and Job Creation Act of 2012 extended the reduction through the end of 2012. Under current law, this temporary reduction expired at the end of December 2012. For 2013, the rate is back to 6.2%. Please keep in mind that this might again change during 2013. Substantial Gainful Activity (SGA) Non-Blind Blind $1,010/mo. $1,690/mo. $1,040/mo. $1,740/mo. Trial Work Period (TWP) $720/mo. $750/mo. 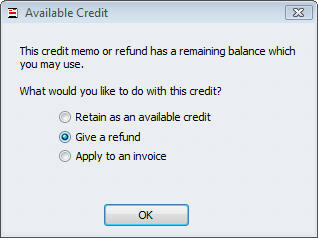 Refunds……You probably wince at the word. 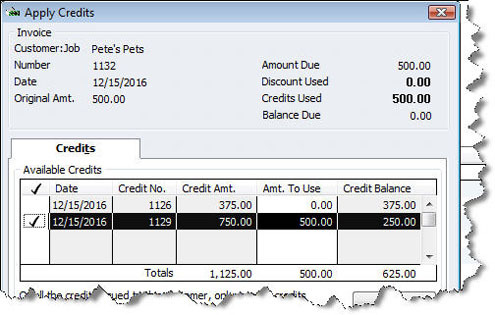 Some — like customer refunds for returns — are fairly uncomplicated, thanks to QuickBooks’ tools. Others, not so much. You may find yourself unable to balance your accounts receivable. 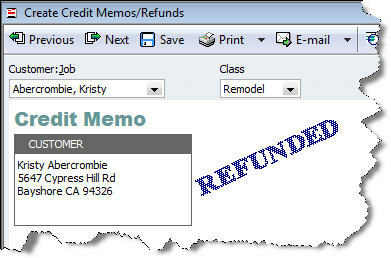 Click Customers | Create Credit Memos/Refunds. Select the correct customer and job (and A/R account, if you have more than one). Enter the items just as they appear on the invoice. If you haven’t contributed funds to an Individual Retirement Arrangement for tax year 2011, or if you’ve put in less than the maximum allowed, you still have time to do so. You can contribute to either a traditional or Roth IRA until the April due date for filing your tax return for 2011, not including extensions.Be sure to tell the IRA trustee that the contribution is for 2011. Otherwise, the trustee may report the contribution as being for 2012 when they get your funds. Generally, you can contribute up to $5,000 of your earnings for 2011 or up to $6,000 if you are age 50 or older in 2011. You can fund atraditional IRA, a Roth IRA (if you qualify), or both, but your total contributions cannot be more than these amounts. Note: IRA contribution limits remain the same in 2012 – $5,000, or $6,000 if age 50 or older. Roth IRA: You cannot deduct Roth IRA contributions, but the earnings on a Roth IRA may be tax-free if you meet the conditions for a qualified distribution.Each year, the IRS announces the cost of living adjustments and limitation for retirement savings plans. In 2011 and 2012, however, the contribution limits for defined benefit and defined contribution plans did not change as the Consumer Price Index did not meet the regulatory thresholds. Saving for retirement should be part of everyone’s financial plan and it’s important to review your retirement goals every year in order to maximize savings. If you any questions regarding this matter, give us a call. We’re here and happy to help.